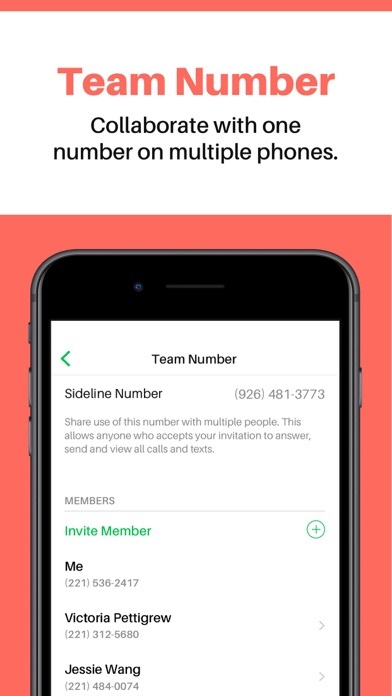 Download Sideline 2nd Phone Number on the AppStore. Better. Faster. More Reliable. That's our motto for every update. If you're enjoying your 2nd number, consider leaving us a review or rating. We'd love to hear from you. 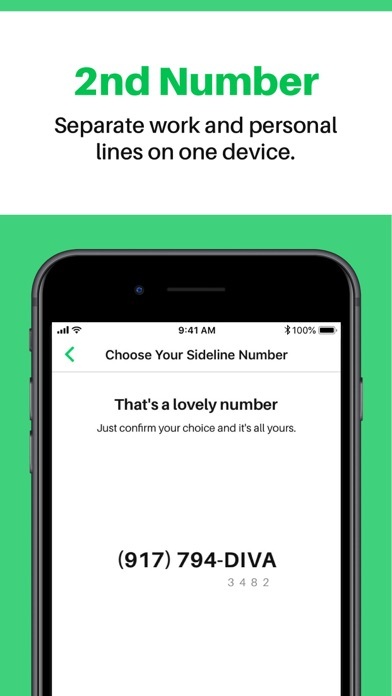 Sideline® is more than a second number. It’s a communication app that helps you work efficiently, connect with customers, and collaborate as a team. Professionals choose Sideline for its unmatched reliability and feature-rich interface that separates work from life. It comes with all the calling, texting, and voicemail features you need to start, run, or grow your business. Don’t settle for a burner phone number or even a Google number! Try it risk free for 7 days to learn what makes Sideline the #1 phone number app and best Google phone alternative. Then subscribe to a monthly or yearly plan and let Sideline pay for itself in happy customers and new business opportunities. There are no contracts so you can cancel anytime. CUSTOM NUMBER – Build your identity with numbers such as “(555) PET-SHOP,” or “(555) FLOWERS.” Pick a professional identity, not a burner phone number. LOCAL AREA CODE – Search area codes to find a local second phone number for your company. Because of these features, we’ve got people porting their Google number to Sideline. 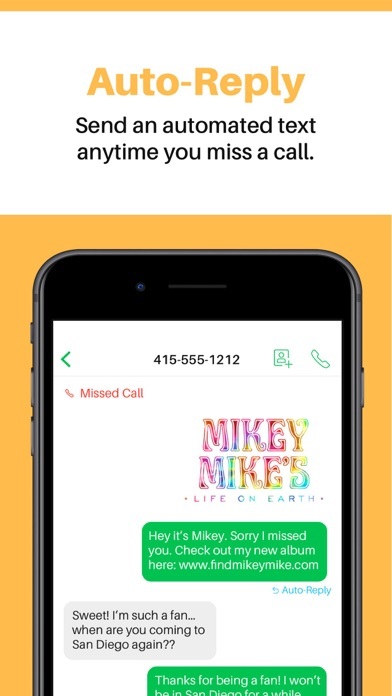 CARRIER RELIABILITY – All calls are cellular (not VoIP) to make your 2nd phone number as reliable as your 1st. WEB MESSAGING – Access your Sideline number online and text from the desktop. 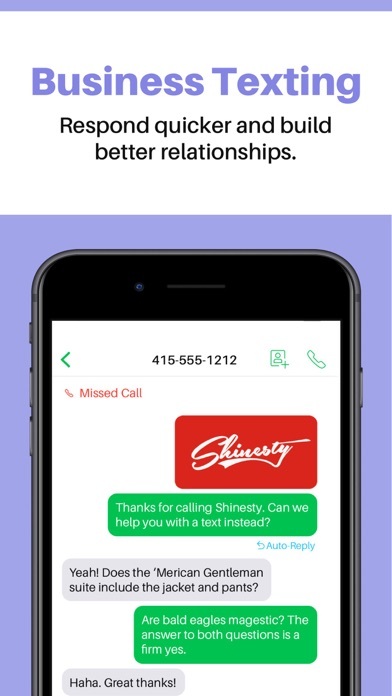 Unlike a burner phone app or the Google phone app, Sideline is a great addition to your suite of small business apps. 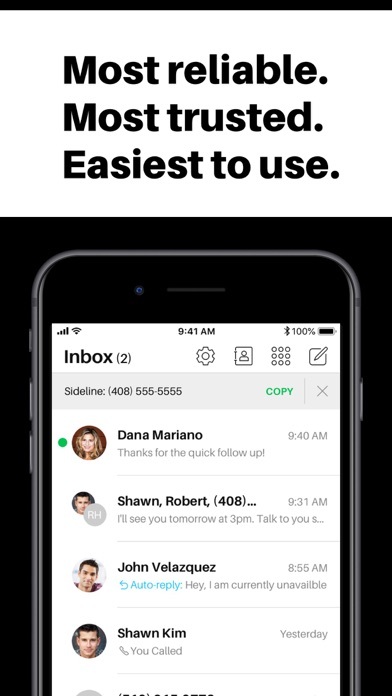 Like Square payments, invoice2go invoicing, GoDaddy URLs, Squarespace websites, or Quickbooks accounting, Sideline is the #1 phone number app solution for on-the-go professionals, small businesses, and growing companies. It’s an essential tool because it works on the communication network your customers already have—their smartphones. You can pick a new Sideline 2nd phone number, but also port numbers over from a burner number, Google number, Smartline, Line2, and many other services. The required Sideline subscription is $9.99/month or $99.99/year. This subscription and other optional in-app subscriptions are automatically billed monthly or annually to your iTunes Account and auto-renew, unless you turn off auto-renew at least 24-hours before the end of the current period. Payments are charged to your iTunes account upon confirmation of purchase. You can turn off auto-renew or manage subscriptions in your iTunes & App Store account settings. Cancellations take effect at the end of the active subscription period. Any unused portion of a free trial period is forfeited when purchasing a subscription.